What do you do when your learning organization grows year after year? How can you deliver the same quality and standards to your clients? How do you scale from managing 3 projects to 40? Directing a learning team has both joys and challenges; here are some practices that will help make your experience a positive one. 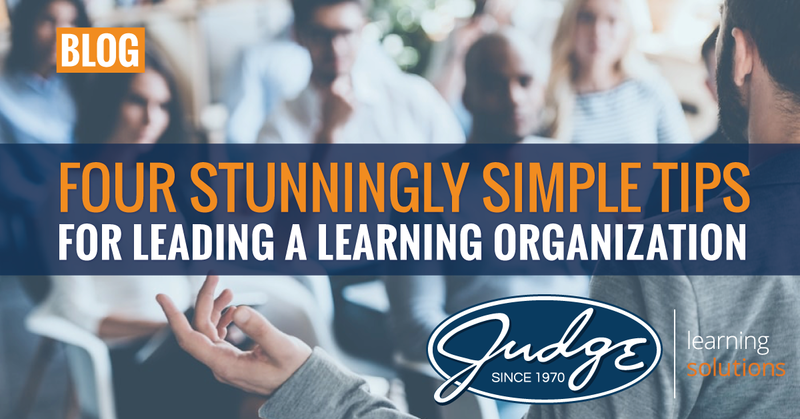 At Judge Learning Solutions, we have developed quite a few standards over the years, and these standards really help keep our projects well-organized and delivered with a consistent, high quality. They also make onboarding new resources much easier. Our standards include Instructional Design Guidelines, Project Management Guidelines, a Writing Style Guide, a Client Evaluation Survey, and a Quality Assurance Checklist. After we look at work samples and interview a candidate who presents high-quality samples, we ask the candidate to complete a vetting assignment. Learning professionals typically work in collaborative environments, so vetting assignments for digital learning, instructor-led training, and technical writing help us confirm the candidate’s skill level, creative abilities, and attention to detail. This process has helped us add great members to our team and use them in ways that lets their talent shine. Prior to the meeting, I ask the project managers to fill out a shared spreadsheet with column headings such as: Project Name, Resource Name, Hours Used, Hours Allocated, SOW Hours Remaining, Estimated Hours Remaining, Next Billable Deliverable, and Current/Potential Issues. In the meeting, we go through each project, and work together to solve any challenges. It is also very helpful for our account management team, as they can stay aware of any current or potential client issue. Having this meeting regularly helps me stay on top of scope issues, monitor resource air traffic control, and ensure we are providing exemplary client care while meeting our own business goals. Strengthen the efficiency of your organization, and therefore drive greater profitability. Each member sends their ideas to me, and then we schedule a meeting to discuss. Don’t forget to REWARD THEM for meeting their plans. As a reward, we give extra days off and other incentives that team members value. I know I was only going to share four tips, but I’m passionate about relationships, so here is a bonus tip. Remember to tell team members you appreciate them. Don’t take team members for granted, even though it is their job to work on these projects. Many of us are great at pointing out mistakes in our profession, but make sure to point out the good, and let your team members know how much you value their contributions. Good luck with implementing these tips! Use the form below to learn more about the services Judge Learning Solutions provides.